Puzzles of all kinds are fun for the challenge – not to mention good for the brain. Typically you see puzzles where you have to find hidden objects from within a picture or word games that knot your brain up trying to figure them out. But this puzzle is one of a different kind. 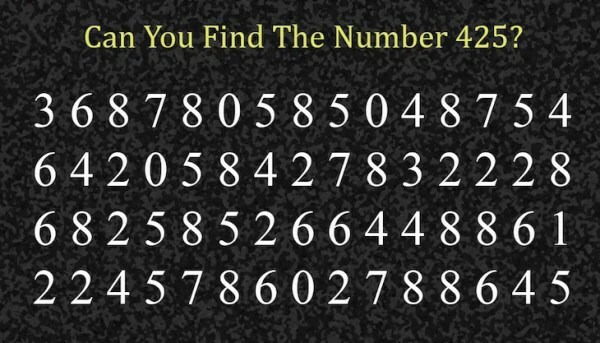 It seems simple at first – just find the number: 425. But the trick to this puzzle is you have to think differently. You already know the saying: “think outside the box.” See, the numbers aren’t in a straight line as your brain is accustomed to reading them. Not to mention, there are several of the same numbers, so you have to look extra hard. Have you figured it out yet? Here’s a hint, look diagonally, then perhaps it will be easy to spot. Were you able to find the “425” quickly?